This minimal blazer has a sleek fit and hidden inner pockets, perfect for your lipstick or phone. It’s finished with sleek hook closures and wool fabric that’s timeless but totally modern. Made in NYC. Structured, slim fit and ultra-flattering seams; hits at the hips. Our model in black is 5’9” and wearing a size 4. Our model in navy is 5’9” and wearing a size 2. If you are in-between sizes, we recommend sizing up. Below are the exact measurements of the Houston Blazer. All measurements are in inches. 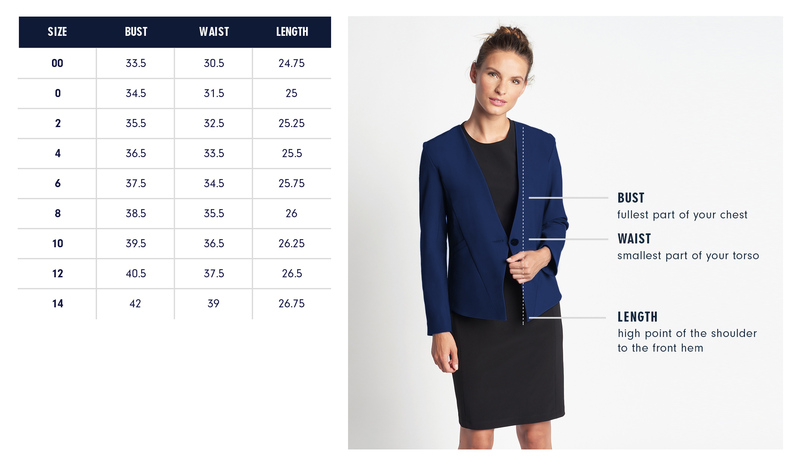 For general brand fit, sizing, and measurements, please visit our Brand Fit & Size Guide. Structured, slim fit; hits at the hips. The design of this collarless blazer is a nod to 90’s minimalism so I wanted the blazer to fasten without compromising the clean lines of the silhouette. Gunmetal hook & eye closures were the perfect solution! Features: Shoulder pads for smooth, structured shoulder and sleeve. Princess seam pockets, hook and eye closure, and vent at lower back for ease.